No matter how fast your assay kinetics are on paper, the rate will be zero if the reactants aren’t in the same place. By ensuring that your reactants are side-by-side, effective mixing can accelerate kinetics, improve analyte utilization, and decrease variability. Mixing is the act of eliminating concentration gradients. Concentration gradients are an obvious issue when two materials—say, a sample and a reagent—come in contact for the first time. But it’s also an issue over the course of an assay, as concentration gradients develop from local depletion zones. These can occur when reactants are scarce, in a crowded molecular environments, or in assays with geometric asymmetries. To provide a case study in the importance of mixing, we used our microfluidic mixing chip, MXR, to make microarray assays up to ten times faster. Why microarrays? Haven’t next generation sequencing (NGS) platforms now eclipsed microarrays for novel genomics work? Yes, they have—for discovery. Meanwhile, microarrays have been steadily working their way into clinical diagnostics. Arrays are far less complex and costly than NGS. Array printers and services are now precise and affordable. Bioinformatics can optimize probe-target specificity. The smartphone electronics ecosystem has generated a wide range of optical and electronic components that enable highly compact, power efficient analytic systems. If a team uses NGS (or any other method) to discover a panel of targets, it’s a good bet than an array-based system will prove to be the best way to turn that panel into a compact, affordable diagnostic test. In other words, microarrays are moving from the bench to the clinic, and ultimately, to the bedside. But with this transition, microarrays face one enormous challenge: speed. Redbud Stage provides a temperature-controlled environment for driving Redbud Posts. It’s an ideal platform for testing MXR with temperature-sensitive molecular assays. Microarray assays are naturally slow because binding of target analytes to the array surface is diffusion-limited. A variety of methods have been used to circumvent this problem, most notably bubble agitation, which is used in most commercially available microarray ovens. Bubble mixing is a poor solution for point-of-care systems; creating the bubble and rotating the cartridge are both impractical. We examined whether MXR, our microfluidic mixing chip, could improve microarray kinetics by improving target transport to the array surface. 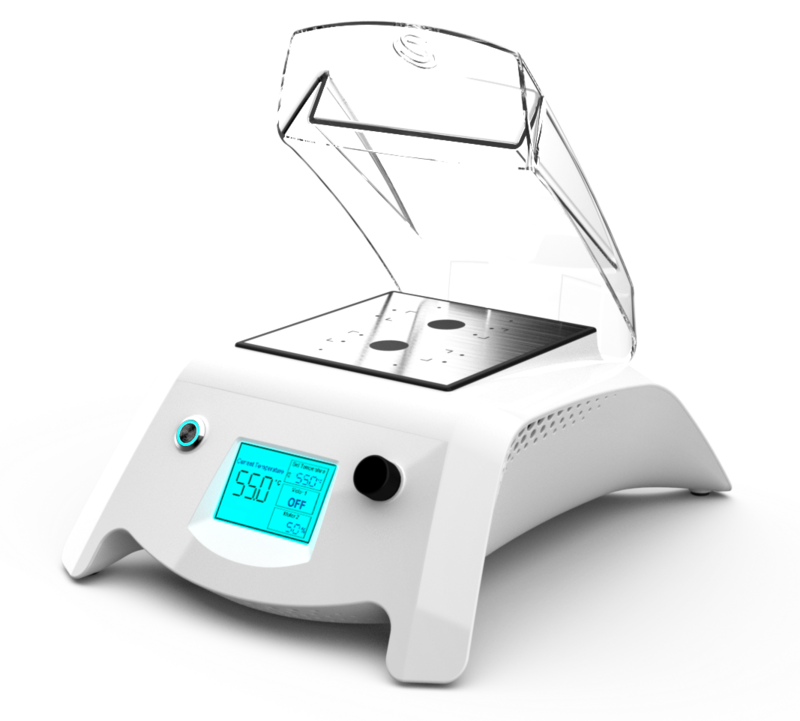 Because microarray assays must be temperature controlled, we created Redbud Stage, a combination of our magnetic driver and a hot plate. Multiple array chambers can be placed on the stage simultaneously, and the drivers can be independently controlled. We then collaborated with our friends at Applied Microarrays (AMI) to see how MXR would affect the performance of genomic and proteomic microarrays. Our MXR chip was tested in a single color genomic microarray assay using AMI’s gene chip (2696 AT Ctrl) containing three probe sets. Biotin-labelled cDNA (120 µL of a mixture of three corresponding anti-sense targets) was added to the microarray chip and hybridized, without MXR mixing (control) or with MXR mixing (MXR), from 2 minutes up to 1 hr. Following washing and staining with Cy5-conjugated streptavidin, the microarray chip was scanned at 635 nm using the GenePix 4000B Scanner. Analyses of fluorescence intensities were performed with GenePix Pro 4.0 software. A comparison of the signal intensity of one probe set without mixing (blue bars) and with MXR mixing (red bars) shows that MXR accelerates hybridization by 6-fold, achieving a comparable signal in 10 minutes (mixed) versus 60 minutes (unmixed). MXR enhances signal intensity by 3-fold at 60 minutes compared to signal intensity of an unmixed chamber at the same time point (figure at left). Our MXR chip was also tested in a proteomic cytokine microarray assay, using AMI’s proteome chip (2463 Ab expt), that contained three probe sets. A mixture of three mouse antibodies (IL-2, IL-6, and IL-10) was added to the microarray chip and incubated for either 10 or 100 minutes at room temperature without mixing (control) or with MXR mixing (MXR). Following washing, streptavidin-Alexa Fluor 647 was added to the chip and incubated for 1 hr at room temperature. The chip was scanned using the GenePix 4000B Scanner and fluorescence intensities were analyzed with GenePix Pro 4.0 software. Performance comparisons of IL-2 binding between control (blue bars) and MXR-integrated assays (red bars) show that MXR expedites binding by 10-fold and increases signal intensity by 2-fold (figure at left). Conclusion: MXR can accelerate microarray kinetics by up to 10x and boost analyte utilization by up to 3x. Microarrays are a promising low-cost, high-volume platform for point-of-care molecular diagnostics. With MXR, microarrays become dramatically faster without compromising on simplicity or size. If you’re looking to expedite your array-based assay, contact us. Redbud Labs has announced new members of leadership as the company poises for upcoming growth. Experienced leaders in the pharmaceutical/life sciences industry, Kathryn Lawrence and Dale Barnes join Jay Fisher who continues leadership of R&D efforts. Kathryn will head the commercial team and Dale Barnes will lead manufacturing efforts. To learn more, visit www.redbudlabs.com. We collaborate with your engineers to develop cost-effective solutions tailored to your cartridge design.